I should know better than to stroll through the produce section of Whole Foods A) while I’m hungry and B) just two days after I get paid. But in our most recent trip, it worked out well. Because there it was, a display of good-sized, bright green artichokes. Three chokes for five bucks. And after a quick consultation with Mrs. Crappy, three good ones made it into our cart. And because it had been years since I’d had one — I think just once since our honeymoon — I was pretty excited. Artichokes are difficult. They’re pointy and tough, and preparing them takes a while, even if the process isn’t especially difficult. Even eating them isn’t intuitive (“Whaddaya mean I scrape them with my teeth?”). I can’t make them appear any less mysterious, but I can tell you what I did when we cooked and ate all three on Saturday … and I hope that will help. Four cloves of garlic, roughly chopped. A couple of lemons, quartered. Some white wine (something between a quarter cup and a half cup). Some parsley (we didn’t have fresh parsley at home, so I put in a handful of dried). Towards the end of cooking, melt a stick or two of butter in a separate pan, and have some extra lemon wedges handy. They look delicious, even in the pot. Trim the tops and the stems of the chokes and add them to the simmering pot tops down. Let them bubble for about 30 minutes before you start checking to see if they’re finished. When a knife runs through the stems without resistance, they’re ready to eat. Make sure they’re well drained before you serve. I misspoke earlier. 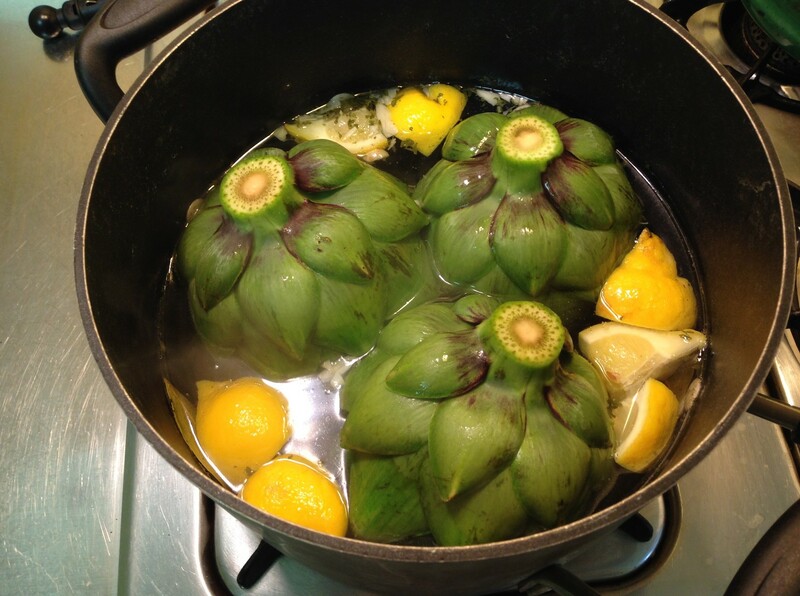 Eating artichokes isn’t difficult, but it is different. Remove a couple outer layers of leaves before you serve the chokes — they’re generally too tough to be enjoyable. Then you remove a leaf at a time, dip it into a bowl of melted butter (I like it with a squeeze of lemon juice too) and scrape the bottom two-thirds of the leaf across your top teeth. The scraping removes the meat from the leaf — that delicious, butter-soaked meat that’s been stewing in garlic, lemons, wine and parsley for 30 to 45 minutes. 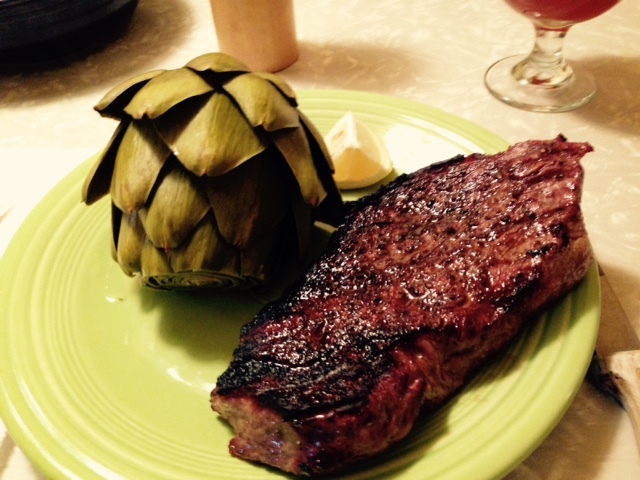 And that’s How You Eat An Artichoke (Part One). Part Two? That happens when you get down to the really flimsy leaves in the middle of the artichoke. 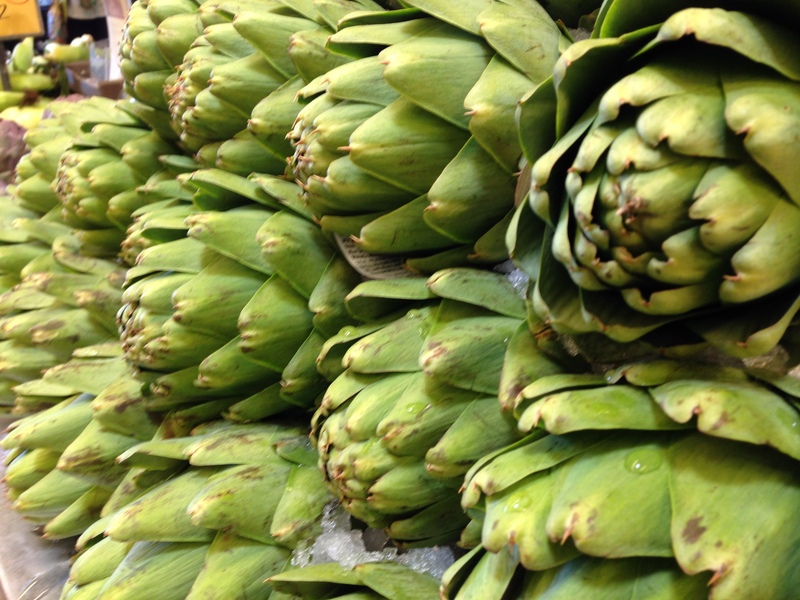 You can eat those, sure; you can also ditch them and dig down to the artichoke’s heart. To get there, remove any remaining leaves and then dig out the the thistle-y part that’s covering the heart. Once the heart is exposed, dig out a bite with a spoon — you could eat the whole thing, but I think it tastes better to leave some of the artichoke’s outer layer behind — dip it in the butter and go to town. 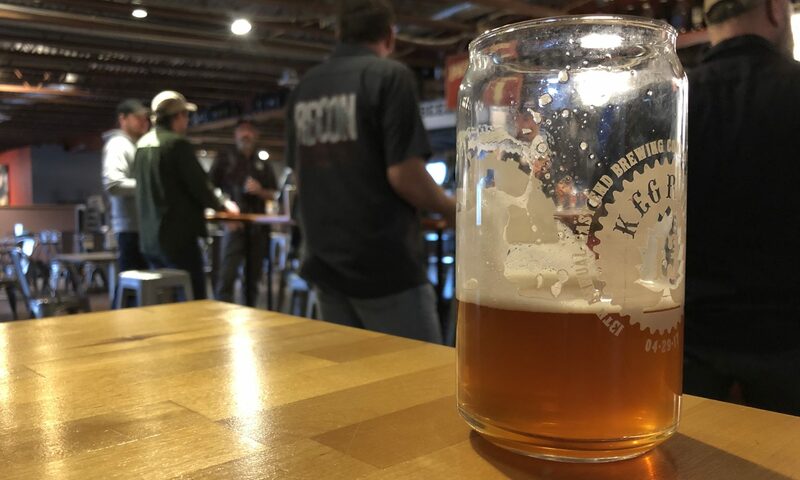 The flavor is unlike anything else you’ll ever encounter. It is also amazing. Artichokes were a special treat when I was growing up, and I think they’ll remain that way now that we’ve kind of broken the seal. But there’s nothing that says we can treat ourselves a little more often than usual. Since we made these a while ago, I’ve been scanning recipes for aiolis or other dipping sauces for the next time. Lots of good stuff to try. I was also going to suggest aioli. My mother used to stuff the artichoke leaves with breadcrumbs. It seems a great shortcoming that I have not yet made these as an adult. Hollondaise. Family tradition to eat artichokes with hollondaise, made from scratch, with a wooden spoon. Artichokes just need to be steamed. oh man, i adore artichokes. although i always steam em (just a bit of salt in the water). totally going to try this boiling way of preparing. thanks for the suggestion! After seeing your tweet about these, I decided to make them on Easter. I found the prep more of a hassle than I expected; those leaves are sharp! I used scissors and snipped off all of the sharp points, and between that and cutting off the tops it took a while. And even though I was continuously rubbing them with lemons the bright green faded to a much less appealing brownish green. Even though they tasted very good, there just wasn’t enough “meat” to make me feel like the effort was worth it. I will, however, be happy to eat them again if someone else makes them for me. That is one of the strangest meals I have ever seen. In the photo, they seem like they are too hard to chew. I believe that with this meal, you would make it to the strangest meals anywhere. What about the taste? You wrote that is is something you have never experienced, but what about the texture? Is it like eating potatoes? I would love to try them, but I’m not sure where to get them. Next PostNext hope you’re thirsty.